Participant : Philippe Ciuciu [correspondant] . Studies employing functional connectivity-type analyses have established that spontaneous fluctuations in functional magnetic resonance imaging (fMRI) signals are organized within large-scale brain networks. Meanwhile, fMRI signals have been shown to exhibit 1/f-type power spectra – a hallmark of scale-free dynamics. We studied the interplay between functional connectivity and scale-free dynamics in fMRI signals, utilizing the fractal connectivity framework – a multivariate extension of the univariate fractional Gaussian noise model, which relies on a wavelet formulation for robust parameter estimation. We applied this framework to fMRI data acquired from healthy young adults at rest and performing a visual detection task. First, we found that scale-invariance existed beyond univariate dynamics, being present also in bivariate cross-temporal dynamics. Second, we observed that frequencies within the scale-free range do not contribute evenly to inter-regional connectivity, with a systematically stronger contribution of the lowest frequencies, both at rest and during task. Third, in addition to a decrease of the Hurst exponent and inter-regional correlations, task performance modified cross-temporal dynamics, inducing a larger contribution of the highest frequencies within the scale-free range to global correlation. Figure 9. Networks definition and correlation structure. 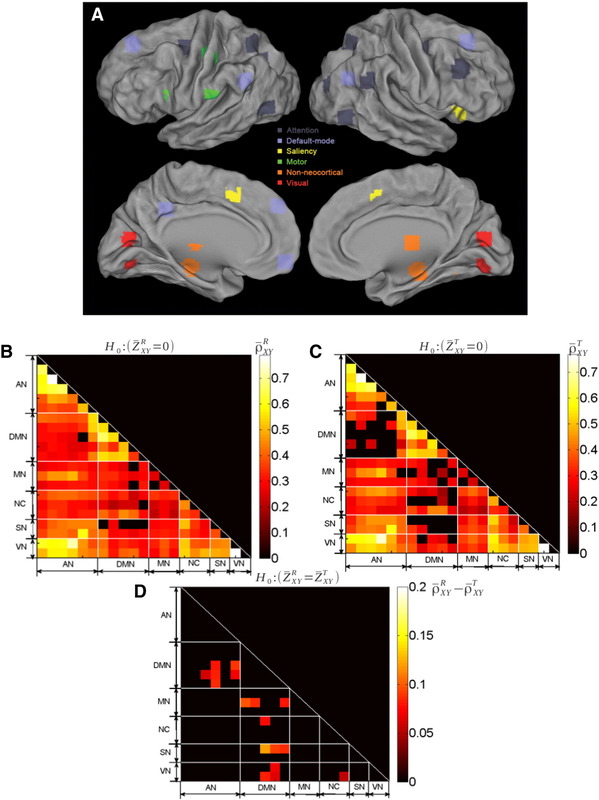 Top (A): ROIs mapped onto the cortical surface, with each color denoting a different network. Middle (B): Group-averaged inter-regional correlation matrix at rest (p < 0.05, Bonferroni corrected). Regions are grouped by network to ease visualization. Middle (C): Group-averaged inter-regional correlation matrix during the visual detection task (p < 0.05, Bonferroni corrected). Bottom (D): Difference of the correlation coefficients between rest and task (thresholded at p < 0.01, uncorrected, two-sample t-test for rest vs. task). The ROIs are grouped by networks; these networks correspond to the diagonal triangles surrounded by white dashed lines.